The perfect entertaining solution for small spaces, this 48 inch Heritage Folding Bar is crafted just for you. 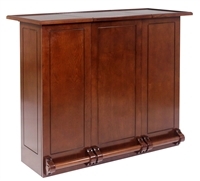 Entertain guests with this mobile free standing bar in virtually any room in your home. Featuring plenty of storage and a locking cabinet for your spirits and what nots. Available in four finish options: Onyx, Black Cherry, Nutmeg & Port . 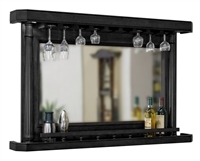 Create a beautiful focal point in any room with this simple lined back bar with bottle shelf and stemware rack. Adding any legacy bar will give you a total home bar experience. Available in Onyx, Nutmeg, Black Cherry and Port finishes. Dimensions: 55" x 6-3/8" x 35"
This back bar features everything you could want; storage drawers, recessed lights in the canopy, bottle shelf and stemware rack. Also, we have laser etched flames and metal accents and our Skull & Flames logo is laser etched into the mirror. Featuring recessed lighting, a large bottle shelf and a stemware rack, this simple yet understated Back bar is a welcomed addition to any home. It serves as a great compliment to any of the Sterling home bar sets and creates a classy, put together entertainment area. Classic style and amazing functionality, all wrapped in one! Our Classic 60" Bar features a wine chiller, lockable liquor cabinet, adjustable shelves and stemware racks- everything you need to enjoy a relaxing night with family or friends. Perfect for any game room, this 60 inch bar features a lockable cabinet, wine chiller, stemware racks and adjustable shelves. Other features are: faux leather accents, studding, metal footrest and laser etching. The coolest feature is LED lighting, for the drink well and over the Skull and Flames logo on the front.